If you add quantum dots – nanocrystals 10,000 times smaller than the width of a human hair – to a smartphone battery it will charge in 30 seconds, but the effect only lasts for a few recharge cycles. 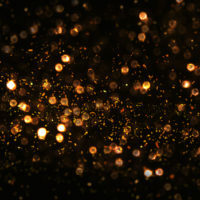 However, a group of researchers at Vanderbilt University report in the Nov. 11 issue of the journal ACS Nano that they have found a way to overcome this problem: Making the quantum dots out of iron pyrite, commonly known as fool’s gold, can produce batteries that charge quickly and work for dozens of cycles. The research team headed by Assistant Professor of Mechanical Engineering Cary Pint and led by graduate student Anna Douglas became interested in iron pyrite because it is one of the most abundant materials in the earth’s surface. 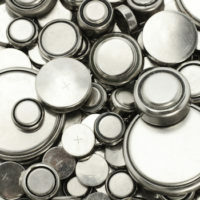 It is produced in raw form as a byproduct of coal production and is so cheap that it is used in lithium batteries that are bought in the store and thrown away after a single use. Aided by Douglas’ expertise in synthesizing nanoparticles, the team set out to explore this “ultrasmall” regime. 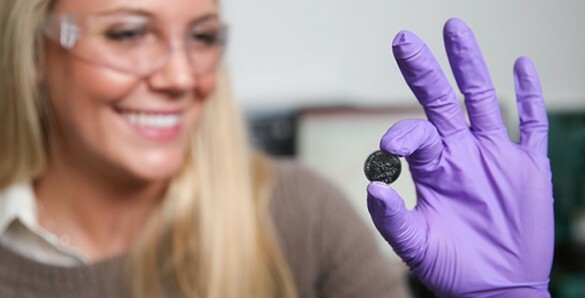 They did so by adding millions of iron pyrite quantum dots of different sizes to standard lithium button batteries like those that are used to power watches, automobile key remotes and LED flashlights. 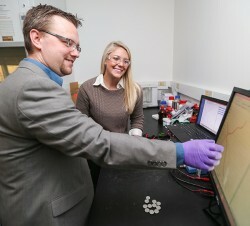 They got the most bang for their buck when they added ultrasmall nanocrystals that were about 4.5 nanometers in size. These substantially improved both the batteries’ cycling and rate capabilities. 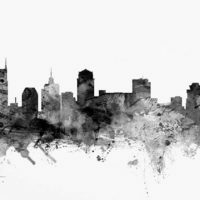 The researchers discovered that they got this result because iron pyrite has a unique way of changing form into an iron and a lithium-sulfur (or sodium sulfur) compound to store energy. “This is a different mechanism from how commercial lithium-ion batteries store charge, where lithium inserts into a material during charging and is extracted while discharging – all the while leaving the material that stores the lithium mostly unchanged,” Douglas explained. 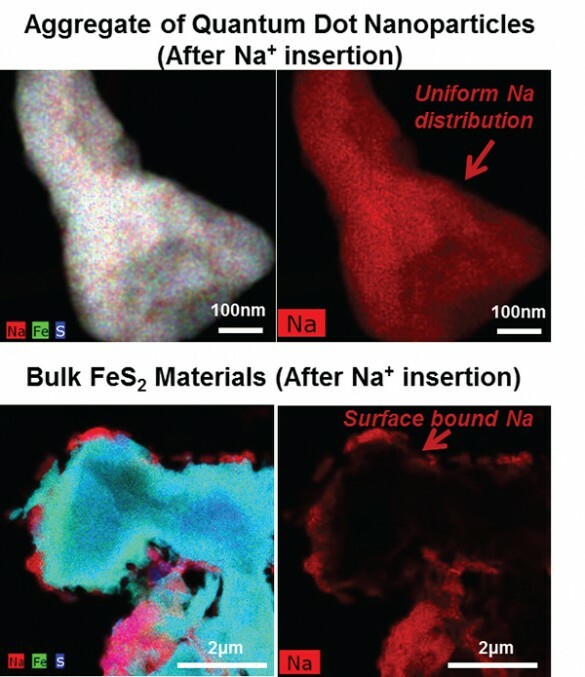 “Instead of just inserting lithium or sodium ions in or out of the nanoparticles, storage in iron pyrite requires the diffusion of iron atoms as well. 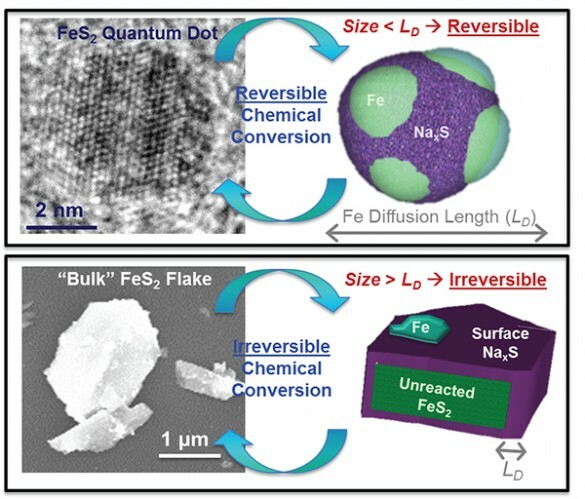 Unfortunately, iron diffuses slowly, requiring that the size be smaller than the iron diffusion length – something that is only possible with ultrasmall nanoparticles,” Douglas explained. A key observation of the team’s study was that these ultrasmall nanoparticles are equipped with dimensions that allow the iron to move to the surface while the sodium or lithium reacts with the sulfurs in the iron pyrite. 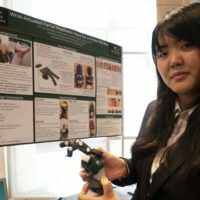 They demonstrated that this isn’t the case for larger particles, where the inability of the iron to move through the iron pyrite materials limits their storage capability. 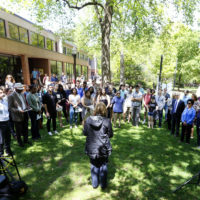 Coauthors of the paper with Pint and Douglas include mechanical engineering graduate students Rachel Carter and Adam Cohn and interdisciplinary materials science graduate students Keith Share and Landon Oakes. The research was funded in part by National Science Foundation grant EPS 1004083 and NSF’s graduate research fellowship program grant 1445197.